Live at the Grindhouse Theater, Vol. 2: Extraterrestrial Funk Experiments. The Absolute BEST in Experimental Electronic Funk Music! Detroitexploitation Funk/Cinema Worldwide! 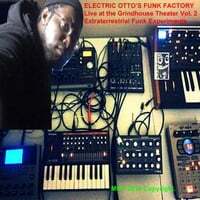 Electric Otto's Funk Factory a.k.a Matthew MCR Ellison II-Instruments: Roland JX-03, Moog Minitaur, Moog Sub-37, Alesis SR-18, Roland SP-404, Mackie Mix8, Tascam DP-03. Recorded and Performed Live and Uncut in a Vacant Grindhouse Theater in Detroit, MI. Recording Date: 11/30/2017.